20 MMS September 2017 mmsonline.com ONE-OFF Commentary A U KO M i s a n a c r o n y m f o r t h e G e r m a n "ausbildung koordinatenmesstechnik," which translates to "coordinate metrology training." U.S. machine shops serving the automotive industry might be familiar with this standard and perhaps have metrologists on staff who are certified in it. Those outside of automotive might not have heard of it but should be aware of the benefits it can offer their manufacturing operations. AUKOM was developed in Germany to estab- lish a global training standard for production coordinate measurement practices. Its method- ology is vendor-neutral, meaning the skills gained and procedures learned during certified training can be applied using any brand of measuring equipment and software. 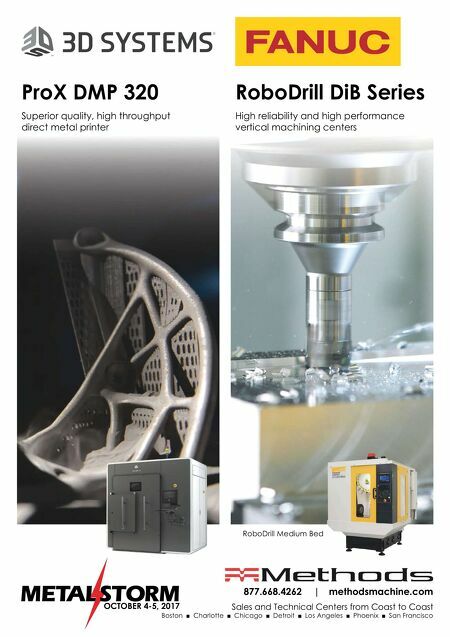 The government-financed research project to create AUKOM spanned 1998 to 2001 and brought togethe r metrolog y ex pe r ts f rom ac ade mia, industr y (primarily automotive) and coordinate measuring machine (CMM) manufacturers. The goal was to create a metrology training curriculum that would ensure measurement uniformity and consistency of results no matter who carries out the measuring routine or where a manufacturing operation is located. This eliminates any potential finger-pointing between supplier and customer, as well as between different departments, work AUKOM Is Coming This coordinate metrology standard originated in Germany, but it could become the de facto, global training method for future production metrologists. shifts or locations within a manufacturing company. AUMOM training is currently of fered in 19 countries. The program consists of three levels with a certificate provided for each upon passing a course exam. Level 1 covers fundamental concepts, such as dimensional tolerancing, basic programming and common measuring equip- ment. Level 2 builds upon these concepts by providing problem/solution instruction related to form and positional tolerances, advanced CMM programming, measurement strategy and docu- mentation. Successful completion of this level in addition to AUKOM's geometric dimensioning and tolerancing (GD&T ) course is required for Level 3 advanced CMM training, which covers production-based measuring, measuring uncer- tainty, quality management and measurement department management. Zeiss, Wenzel and Made to Measure of fer AUKOM classes in the United States. In fact, all Zeiss applications engineers are required to take the course s be cause it of fers such a sound metrology foundation, says Aliesha Anderson, the company's applications internal training and development manager. "The AUKOM training approach sets clear guidelines for measurement tasks and best prac- tices," Ms. Anderson says. "It ensures that metrol- ogists not only have the skills to effectively mea- sure parts, but also enables them to measure parts faster, have a better understanding of the costs related to measurement inefficiencies, and more ef fectively communicate with dif ferent depar tments within their companies because of the common metrology language AUKOM establishes." She also notes that Zeiss is seeing increased interest in AUKOM from industries such as aerospace and oil and gas. 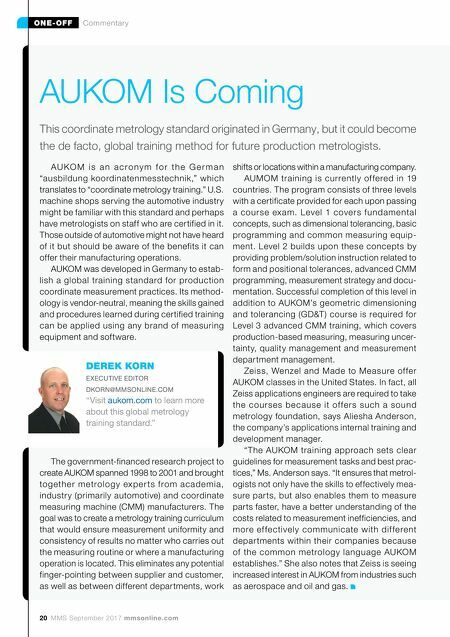 DEREK KORN EXECUTIVE EDITOR DKORN@MMSONLINE.COM "Visit aukom.com to learn more about this global metrology training standard."